Matching Lime Green Bow and Beach Towel, this makes the perfect gift! Everyone needs their bow and towel to be embroidered so that they know for sure it is theirs, so add it on. This is a 2.25" lime green grosgrain ribbon that is attached to a French clip. 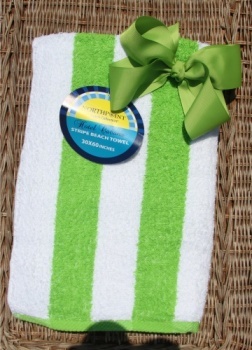 The beach towel is a white and lime green striped towel. This match will look great for your beach trip or just to the pool together.